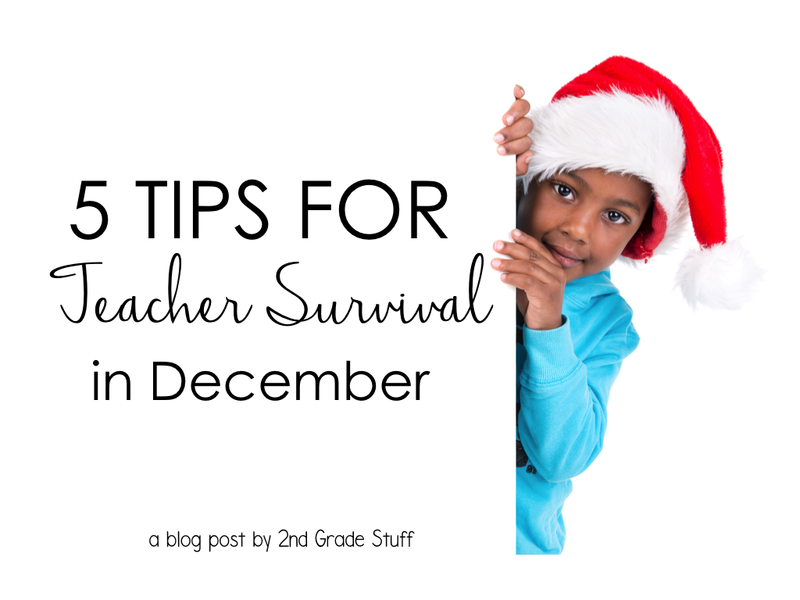 "Teaching in December is easy," said no teacher ever. Do you find your students' excitement to be through the roof? How about their behavior? Is it also through the roof? Haha! I can relate... but I do have a few tips and tricks that I have found really help to calm the chaos in the month of December, or at least embrace it. They're kids. They're going to be excited for the holidays, but it doesn't have to overwhelm you. 1. Build on the excitement. Are your students super excited for the holidays? Are they even more excited, or ready, for a break from school? Use it to your advantage! Find even the tiniest of ways to use that excitement throughout your day. Try a seasonal call and response! Teacher: Santa Claus is comin'! Students: to town! Teacher: On Dasher! On Dancer! Students: On Prancer! And Vixen! Teacher: Run, run, as fast as you can! Students: You can't catch me, I'm the gingerbread man! Teacher: All aboard! Students: The Polar Express! Teacher: Frosty! Students: The Snowman! Teacher: Jingle Bells, Jingle Bells! Students: Jingle all the way! Teacher: Here comes Santa Claus, Here comes Santa Claus! Students: Right down Santa Claus Lane! Use fun holiday incentives for good behavior. Hold a class behavior challenge. Reward the students for whole-class good behavior with "snowballs" or white fuzzy poms in a jar. When the jar is full, the class gets a small reward. 2. Respect student emotions and beliefs. Not every student will be excited about a holiday break. Some students may not be looking forward to the time away from school at all. Acknowledge it and respect it. Your students' social and emotional well-being matters. Keep in mind that not all students celebrate the holidays in the same way. Take their thoughts, beliefs, and traditions and learn from them. Allow students the chance to express their emotions and share their beliefs. This will keep that sense of community alive and well in your classroom during the holiday season. 3. Maintain structure and routine. This one is a biggie. While I love some seasonal activities (and we do a lot of them), I also believe that maintaining the routine in the classroom is key to keeping misbehaviors at bay. In my class, I continue running guided math and guided reading groups all the way up until the last day before break. I do this because it's our norm. Take a student out of their norm and that's when we might see some issues arise. Keep the structure. Keep the routine. Keep your expectations high... and offer positive reinforcements like crazy! 4. Sprinkle in the seasonal activities. This is where it gets fun! I know in the tip above I mentioned that we maintain our norm, but that doesn't mean we don't add some seasonal goodness into that routine. Instead of reading our basal series, we can read some of our favorite seasonal picture books. Rather than our typical guided reading texts, add in some holiday passages. And everybody loves a good ole Holidays Around the World study! This season wouldn't be complete without it. I add seasonal graphic organizers to our guided reading stations. I add some fun holiday erasers into our guided math games to use as counters or game pieces. I put some seasonal writing prompts into our writing center. For morning work, we even practice paragraph writing, but with a holiday twist! It's easy to sprinkle in the fun while keeping the structure and routine the same as any other day. Just make small tweaks here and there. This seems to be all the buzz lately and for good reason. As teachers, we do not take care of ourselves. We come to school sick, we stay and work late, we bring our work home. Are you nodding your head in agreement? I am. Let's remember that during a slightly stressful season of teaching, we have to take care of ourselves. You can't pour from an empty cup! The month of December as a teacher is tough. It kinda reminds me of October. It's busy, but exciting, and can get crazy overwhelming. So dear teacher, build on that excitement. Respect their emotions and beliefs regarding the holidays. Maintain structure and routine while sprinkling in the holiday fun. Most importantly, my friend, take care of YOU. Finally, let's remember, they're just kids. Let them be little.